Quality Air Heating and Air Conditioning > Articles > Air Conditioning > Is the Time Right for an Air Conditioning Replacement? Is the Time Right for an Air Conditioning Replacement? Think back to the previous summer season. Were you 100% satisfied with the overall operation of your home cooling system? If not, what was the cause of your dissatisfaction? These are important questions to be asking at this time of the year. We are certainly not in the thick of it as far as heat goes just yet, but before you know it the temperature outside is going to soar. 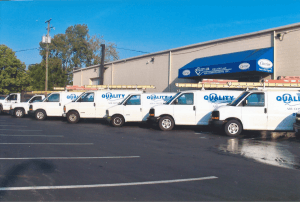 If this is the year for an air conditioning replacement in Columbus, OH, you want to have that new system in place before you really need to be running your air conditioner regularly. Dial our number if you suspect, after reading the following tips, that you’d benefit from an AC replacement before summer sets in. Is Your Air Conditioner in its Twilight Years? The desire to run your AC until it finally gives out on you entirely is understandable. After all, you want to get the greatest return possible on your original investment. However, it is always best to act preemptively if your air conditioner is on its way out, as a total breakdown leaves your home vulnerable, potentially during the hottest time of the year. If your air conditioner is creeping up on the end of its projected lifespan, or if it has already passed this landmark, scheduling a replacement may be the best way in which to protect your comfort. What Are its Repair Needs? Is your air conditioner reliable? If not, we ask that you keep in mind the fact that an air conditioner may be repaired, but may not be worth repairing. If you are spending a lot of money having your system repaired with any regularity, investing in a new, more reliable system may benefit you, and your wallet, greatly. Does it Suit Your Preferences? Many homeowners inherit their first HVAC systems when they purchase their first homes. This means that the existing system was chosen by the previous owners, and that it may not suit your needs exactly. If you know that you’d like to be using a different cooling system in your home, that alone is enough to justify the replacement of that system, particularly if it is of a low efficiency or is not very reliable, anyway. Contact Quality Air Heating and Air Conditioning with any questions that you may have.